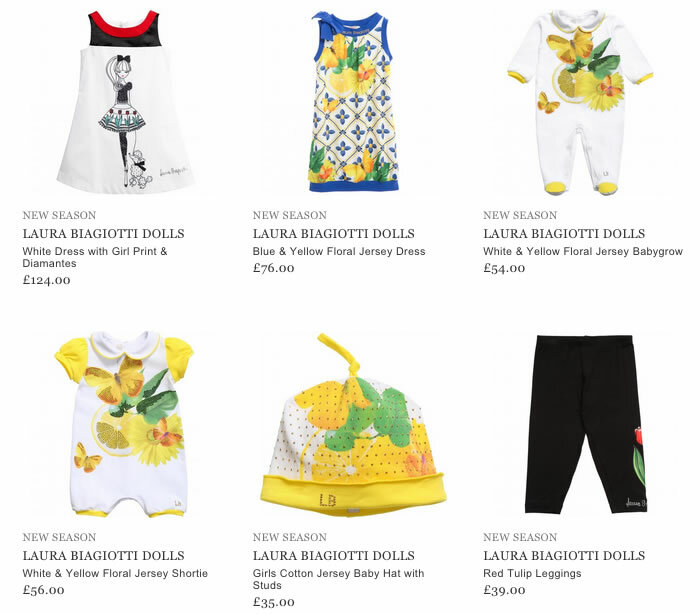 LAURA BIAGIOTTI DOLLS is an Italian brand of children clothing that was created by Laura Biagiotti, a well known designer who was fond of fashion since being a girl. She started her business in 1972, manufacturing clothes for women only, but soon a men and kids’ collection appeared. Now the brand is occupied with creating not only stylish clothing, but cool accessories and comfortable shoes. Children of different age may enjoy the products of LAURA BIAGIOTTI DOLLS. It impresses with a wide color spectrum. Floral dresses, bright leggings, tartan trousers and shorts are made from high quality fabrics, such as 100% cotton, wool, denim, velvet and velour. To add some more chic to their products, the creative designers use delicate elements; among them are sequins, silky bows, ruffles, bright pleats and leopard prints. A small collection of remarkable accessories is also offered to stylish boys and girls. Babies can be pleased with great variety of cool cotton bibs and unisex baby nests and blankets. It is worth noticing that a big attention is paid to tartan pattern, which prevails in many items of clothing and accessories. Today the products of LAURA BIAGIOTTI DOLLS brand can be purchased online as well.